The earliest bridge, built by the Romans, linked Stonegate (the via praetoria of the Roman fortress) and Micklegate, and crossed the river approximately where the Guildhall now is. Its replacement, Ouse Bridge, was a wooden bridge built about 350 metres downstream by the Vikings. It has been rebuilt three times, most recently between 1810 and 1820. The Scarborough Railway Bridge of 1845 was the second bridge to be built, and it was followed by two more road bridges, Lendal Bridge in 1863 and Skeldergate Bridge in 1882. The Millennium Bridge, a footbridge, was added in 2001. There are also Clifton Bridge in the northern suburbs of the city, two modern fly-overs carrying the outer ring road, and the former railway bridge at Naburn, which is now part of the York-Selby cycle path. The original Roman bridge over the Ouse was eventually replaced by a wooden bridge built further downstream by the Vikings. In 1154, it collapsed under the weight of a crowd which had gathered to greet St William of York on his return from exile. It was replaced by a stone bridge. In 1367 the first public toilets in Yorkshire, and likely England, were opened on the bridge. Part of the bridge was swept away by floods in the winter of 1564–5. 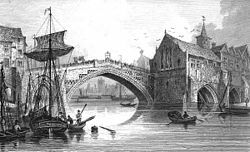 The repaired bridge of 1565 had a new central arch spanning 81 ft, and was described by Defoe as "...near 70 foot [21 m] in diameter; it is, without exception, the greatest in England, some say it's as large as the Rialto at Venice, though I think not." This bridge was dismantled between 1810 and 1818 to make way for the New Ouse Bridge, designed by Peter Atkinson the younger, completed in 1821. It is a Grade II listed building. The second bridge across the Ouse was the Scarborough Railway Bridge, built in 1845 to carry the railway line between York and Scarborough (now the Scarborough branch of the North TransPennine route). Originally it had two tracks with a pedestrian path in between them. In 1875, the track was raised 4 feet (1.2 m) and the footpath moved to the south side, where it remains today. This bridge had a £6 million renovation in 2015 with the main decks being completely replaced. Lendal Bridge stands on the site of a former rope-ferry where the city walls break for the River Ouse. This was the ferry used by Florence Nightingale when she visited York en route to Castle Howard in 1852. The bridge connects two medieval towers: Lendal Tower on the east bank and Barker Tower on the west bank. It was designed by civil engineer Thomas Page, who also designed London's Westminster Bridge. It is made of cast iron, and has a single span of 175 feet (53 m). Page's bridge was the second attempt to build a bridge on the site. The first, begun in 1860 by William Dredge, collapsed during construction, and five workmen were killed. Parts of the structure were later taken to Scarborough and used in the Valley Bridge there. In 1861, permission was obtained from Parliament for a new bridge to be built, and the Corporation of York requested Thomas Page to design a replacement. His Gothic Revival bridge opened in 1863. Together with the attached tollhouses it is a Grade II listed building. Lendal Bridge links Station Road with Museum Street and thus York railway station with York Minster, and is part of York's Inner Ring Road. Lendal Bridge was used in Damon and Debbie, a 1987 spin-off of soap Brookside for the scenes where long-running character Damon Grant was murdered. The BBC Television series 'Gunpowder' (2017) used Lendal Bridge as a location. Motor traffic (except for buses) was restricted daily from 10.30 a.m. to 5.00 p.m. on Lendal Bridge during a six-month trial period from August 2013 to February 2014. The trial objectives were to establish whether a permanent restriction would reduce congestion in York city centre, improve the environment and improve the reliability of certain bus routes. The traffic ban was enforced with ANPR cameras. Air quality and bus route reliability increased during the trial but the public and business opinions on the trial were very negative so the bridge was re-opened to motor traffic after the trial. Skeldergate Bridge links the York Castle area to Bishophill. It was designed in a Gothic Revival style by civil engineer George Gordon Page, and built between 1878 and 1881. The small arch at the east end had an opening portion, powered by machinery in the Motor House, which also served as a toll house and accommodation for the toll keeper and his family. The bridge opened to admit tall masted ships to the quays on either side of the river between Skeldergate and Ouse Bridges. Skeldergate Bridge was formally declared free of tolls on 1 April 1914. Together with the attached tollhouse, it is a Grade II listed building. A temporary bridge over the River Ouse at Clifton was built by the British Army in 1961 on the site of an old ferry crossing to handle additional vehicle traffic caused by the wedding of the Duke and Duchess of Kent at York Minster. A permanent bridge was opened officially on 28 October 1963. The bridge is built from 4,000 tons of concrete and 50 tons of reinforced steel. Outside the outer ring-road, the Naburn swing bridge, built in 1871, used to carry the York-Selby railway until it was diverted in 1983. The bridge now constitutes part of the York & Selby cycle path, connecting the TransPennine trail to York. It is also known as the "Fisherman Bridge" due to a large metal sculpture of a fisherman with bike and dog, sitting on top which was added in 2000 as part of the York Council "Creative Communities 2000" scheme. The Millennium Bridge, built to a competition-winning design by Whitby Bird and Partners, was opened on 10 April 2001, having cost £4.2 million to build. It spans the River Ouse to the south of York, linking Hospital Fields Road and Maple Grove in Fulford with Butcher Terrace on the South Bank. The bridge carries a cycle path and a footpath, and is not open to vehicular traffic. It is a key link in the Sustrans National Cycle Routes 65/66 and is part of the orbital route for York completed in 2011. The bridge shortened the walk or cycle for students from houses in the South Bank to the University of York (they previously had to travel via Skeldergate Bridge). The bridge also acts a meeting place for local people, as it has a waist height shelf spanning the whole structure which facilitates sitting and admiring the view.Increasingly it is used as a circular walk from the city centre taking in the New Walk on the east bank and Terry Avenue and Rowntree Park on the west bank. While riverside paths regularly flood several times a year the bridge is higher and rarely cut off by floodwaters. Signs on approaches from Fulford Rd /Hospital Fields Rd junction and Butcher Terrace/Bishopthorpe Road warn when it may be impassable without wellies. At night the bridge is illuminated by banks of lights in different colours, so that the colour of illumination changes every few seconds. Supplies for Fulford Barracks were brought in by river near this location, and the remains of a narrow gauge railway may be seen on the eastern bank of the river a few metres toward the city. There used to be a rope ferry at this location as well. There may have been a rope ferry at one time, but in the 20th century it was a sculled ferry (rowed by a single oar at the stern) right into the 1950s when the ferry boat became motorised. It was particularly used by the Terry's workers (with their bikes), who lived on the Fulford side of the Ouse. The Millennium Bridge from Fulford. Below the bridge from Fulford. Blue Bridge, where the Ouse meets the Foss. The Blue Bridge crosses the River Foss just above its confluence with the River Ouse. The original bridge on the site was built in 1738, the current one being constructed in 1929–30. In the early 1730s a section of the eastern river bank of the Ouse was improved, at the expense of the city, to create an area lined with trees along which the citizens could promenade. It proved so popular that within a few years this New Walk was extended further south past the junction with the Foss by way of a wooden drawbridge. This new bridge was painted blue and the colour and name have endured though the bridge itself has been replaced several times, the first of these being in 1768 when a single arch stone bridge was constructed. In 1792 the Foss Navigation Company built a wooden swing-bridge to enable boats to access the Foss and this type of bridge was used again when the bridge was rebuilt in 1834. In 1857–58 an iron opening-bridge was built along with two stone plinths upon which stood two Russian cannons. These had been captured at the Battle of Sebastopol in 1855 and became the Crimean War Memorial in York and as such were retained when the current bridge was built in 1929–30 only to be removed in 1941 when they were scrapped and reused for the war effort. The Foss Bridge, a single Georgian gritstone arch with balusters, links the streets Fossgate and Walmgate. It is believed that the earliest bridge on this site was constructed during the Viking period. The present bridge, designed by Peter Atkinson the younger and erected in 1811–12, replaced a wooden bridge. The bridge was once the site of a fish market. It is a Grade II* listed building. This cast-iron pedestrian bridge from Foss Islands Road to what is now the Defra site at Peasholme Green was constructed in 1931 by the Monk Bridge Construction Company to improve communications between York's power station and its cooling tower, both now demolished. It is locked and not in use. Monk Bridge is a single-arched ashlar bridge with a span of approximately six metres. It carries traffic between central York and Heworth and was built in 1794 to designs by Peter Atkinson the elder. In 1924–6, the bridge was widened and the upper part rebuilt. ^ a b c Pevsner, Nikolaus; Neave, David (1995) . Yorkshire: York and the East Riding (2nd ed.). London: Penguin Books. ISBN 0-14-071061-2. ^ Historic England. "OUSE BRIDGE AND ATTACHED FLIGHTS OF STEPS (1259354)". National Heritage List for England. Retrieved 15 June 2015. ^ "Rail passengers, York residents and visitors to the city are being thanked for their patience after the old bridge deck of Scarborough Rail Bridge was removed and a new one installed". City of York Council. 23 February 2015. Retrieved 8 December 2015. ^ "When Disaster Struck Lendal Bridge". York Press. 11 August 2014. Retrieved 1 August 2017. ^ Brandon, Ed (2013). Curiosities of York. Gloucesershire: Amberley Publishing. ISBN 9781445627717. Retrieved 15 April 2015. ^ "Lendal Bridge". History of York. Retrieved 1 August 2017. ^ Historic England. "EAST LODGE OF LENDAL BRIDGE LENDAL BRIDGE AND ATTACHED TOLLHOUSES (1257475)". National Heritage List for England. Retrieved 15 June 2015. ^ Hordley, Chris (20 October 2017). "Where was BBC's Gunpowder Filmed?". Creative England. Retrieved 29 November 2017. ^ "Lendal bridge trial evaluation report". City of York Council. Retrieved 31 July 2015. ^ "Skeldergate Bridge". Yorkshire Gazette. 12 March 1881. ^ "Skeldergate Bridge: History of York". www.historyofyork.org.uk. Retrieved 1 August 2017. ^ Historic England. "SKELDERGATE BRIDGE AND ATTACHED TOLLHOUSE, ABUTMENT WALLS AND STEPS (1256602)". National Heritage List for England. Retrieved 15 June 2015. ^ "Building bridges". York Press. 9 April 2001. Retrieved 1 August 2017. ^ "Spanning the Ouse". York Press. 17 September 2001. Archived from the original on 1 February 2014. Retrieved 25 January 2014. ^ "Trans Pennine Trail". Retrieved 11 September 2012. ^ "Cycle the Solar System". Solar.york.ac.uk. Retrieved 25 January 2014. ^ a b "Blue Bridge". Open Plaques. Retrieved 19 September 2016. ^ Combe, William (1785). "The history and antiquities of the city of York, Volume 2". York. p. 187. Retrieved 14 September 2016. ^ "Georgian: A New Walk". York Museums Trust. Retrieved 14 September 2016. ^ a b "'City walls, bars, posterns and bridges', in A History of the County of York: the City of York, ed. P M Tillott (London, 1961), pp. 510-520". British History Online. Retrieved 14 September 2016. ^ Drake, Francis (1788). "Eboracum: Or, The History and Antiquities of the City of York, from Its Origin to this Time, Volume 2". York: T. Wilson and R. Spence. p. 2. Retrieved 14 September 2016. ^ Historic England. "FOSS BRIDGE (1257827)". National Heritage List for England. Retrieved 15 June 2015. ^ Mitchell, Vic, and Keith Smith (2003). Branch Line to the Derwent Valley, including the Foss Islands Branch (Map V). Midhurst: Middleton Press. ISBN 1-904474-06-3. Wikimedia Commons has media related to Bridges in York.